"Guanine radical chemistry reveals the effect of thermal fluctuations in gene promoter regions". DNA is not the static entity that structural pictures suggest. It has been longly known that it “breathes” and fluctuates by local opening of the bases. We have shown that the effect of structural fluctuations, exhibited by AT-rich low stability regions present in some common transcription initiation regions, influence the properties of DNA in a distant range of at least 10 base pairs. This observation is confirmed by experiments on genuine gene promoter regions of DNA. The spatial correlations revealed by these experiments through a new light on the physics of DNA and could have biological implications by contributing to the cooperative effects needed to assemble the molecular machinery that forms the transcription complex. Published: Nucl. Acids Res. (2011) 39 (12): 5276-5283. "Melting transition and structural correlations in B-DNA fibers by means of neutron scattering." 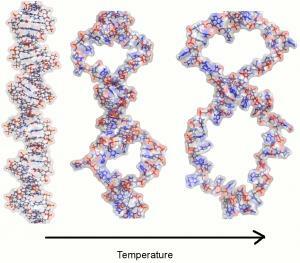 The melting transition of DNA, whereby the strands of the double-helix structure completely separate at a certain temperature, has been characterized using neutron scattering. A Bragg peak from B-form fiber DNA has been measured as a function of temperature, and its widths and integrated intensities have been interpreted using the Peyrard-Bishop-Dauxois model with only one free parameter. The experiment is unique, as it gives spatial correlation along the molecule through the melting transition where other techniques cannot. Title: Thermal Denaturation of DNA Studied with Neutron Scattering. "How to prepare a dipolar supermagnetic state." We have recently prepared a model superspin glass, namely, a material with magnetic properties mimicking those found in conventional spin glasses, but with the atomic spins substituted by nanoparticle superspins, and with exchange interaction replaced by classical dipolar interactions. It has been shown that this system (of ferrimagnetic nanoparticles randomly close packed together) exhibits a phase transition as abrupt as canonical spin glasses. 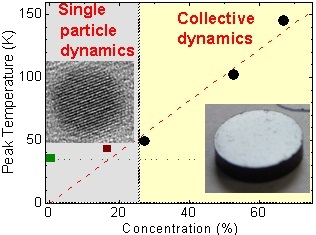 In a complementary publication using core-shell maghemite-slica nanoparticles, the same authors show that interparticle superexchange interactions between the oxide particles do not play an important role (versus dipolar interactions) in establishing the low temperature glass state. "Dipolar interactions studied in nanogranular films assembled by inert gas condensation." A series of nanogranular samples has been prepared using an unfiltered beam of Co nanoparticles preformed by inert gas condensation. 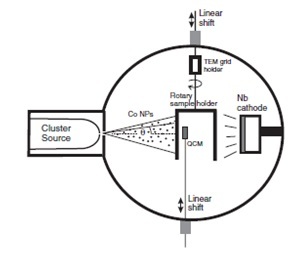 The preparation technique is shown to be a simple and effective method for fabricating, in a single deposition step, a sample series across which both particle size and concentration vary. The technique has been employed to confirm the Dormann-Bessais-Fiorani model, which predicts an enhancement of the effective particle anisotropy barrier in the weak-interaction regime, across a wide range of weak-moderate dipolar interaction strengths (7 - 19%, normalized to the median anisotropy energy barrier). Our study also provides information on (i) the oxidation of nanoparticles in granular systems and (ii) the size-dependent divergence of nanoparticles ejected from a cluster source. "Initial stages of helium bubble clustering in copper from first principles." Very accurate ab-initio calculations have been performed to analyse the energetics of the formation of helium bubbles inside a copper crystal. 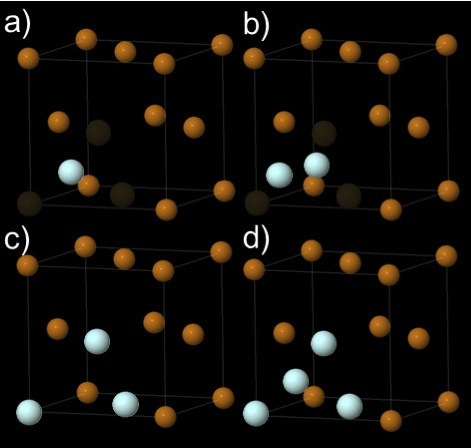 The effect of placing several He atoms, either inside an n-vacancy previously formed, or as interstitials inside the initial perfect bulk matrix, has been studied. Based on Density Functional Theory (DFT) techniques, the results show that He atoms prefer to aggregate forming small bubbles at n-vacancy sites rather than at interstitial positions in the perfect crystal. For a given number of He atoms inside an n-vacancy, NHe , the minimum formation energy is found when NHe is equal to the number of vacancies n, confirming the deep trapping of He atoms inside vacancies, as is well known for other metals. The secondary consequence, given the unprecedented accuracy of the simulations performed, is that the full set of formation and binding energies obtained in this work will be of the highest relevance as an input for new approaches to kinetic Monte Carlo simulations on defects in Cu. Authors: C. González, D. Fernández-Pello, M. A. Cerdeira, S. L. Palacios and R. Iglesias. Author Affiliations: Departamento de Física, Universidad de Oviedo, 33006 Oviedo, Spain. © Advanced Materials, Nuclear Technology and Applied Nanotechnology Department. University of Burgos. Authors: Santiago Cuesta López, Oscar Tapia Júdez, Ekhi Arroyo Fernández de Leceta. Funding by Ministerio de Economía y Competitividad.